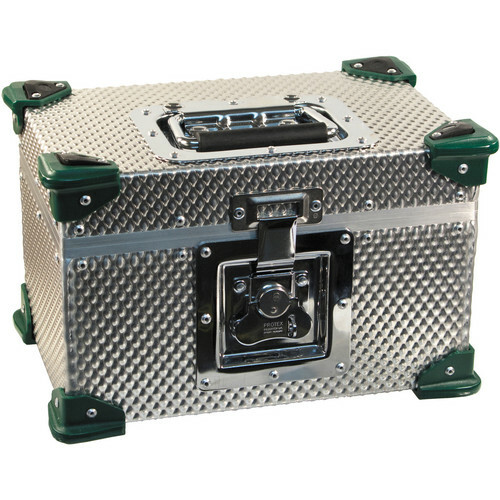 Designed to protect your mini S4/1 lens, the miniS4/I Aluminum Lens Case for 135mm T2.0 Prime Lens from Cooke carries and cradles your lens during transport or storage. The interior is lined with custom cut specifically for your lens, and the rugged aluminum case featured a diamond pressed pattern that increases the strength of the case while reducing its weight. The case features plastic external corners and an inset top handle that allows you to grab the case from the top. A single twist type latch secures the lid, and allows you to secure it with an optional zip tie or split key ring. Built specifically to hold the Cooke mini S4/i 135mm lens. Plastic corners protect the aluminum corners from denting and splitting.